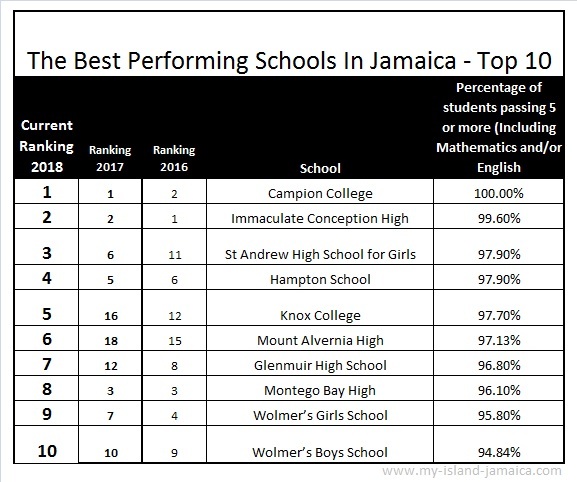 Thanks to Educate Jamaica, here is the very latest ranking of the high schools in Jamaica - with my personal take on them! But.... prepare to be surprised! But who were the best? To review the rankings from the previous, click the links below. 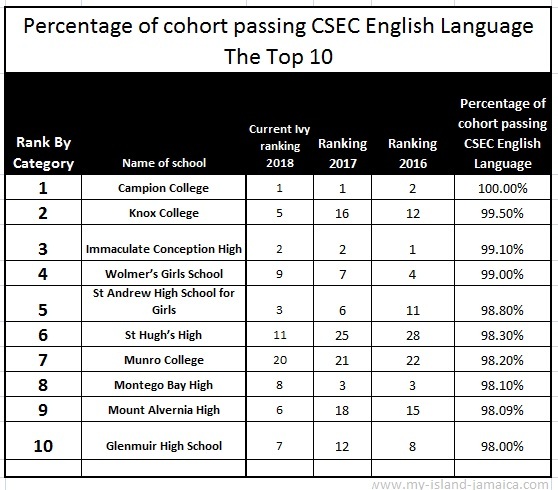 According to the president of Educate Jamaica, the think tank that publishes this prestigious awards, the "Ivy League Ranking speaks to the performance of schools delivering on 50% or more of their students obtaining 5 or more CSEC passes (including Mathematics and/or English) for the entire cohort." 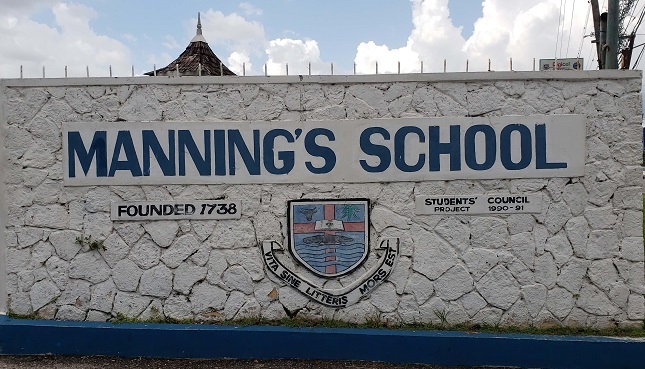 He indicate that they looked at "each school and calculate the percentage of students, at the end of grade 11, achieving a minimum of 5 CSEC subjects (including Mathematics and/or English) and based on the percentage obtained they are ranked." It is critical to note however that the percentage of students is calculated based on the cohort and not sittings. They also took into account the students who achieved passes in their subject (s) prior to grade 11, that is grad 7-10. 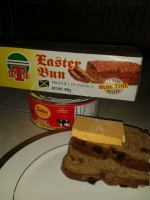 A big salute (again) to the team at Educate Jamaica for the wonderful work they did, and continues to do. I can only imagine the effort that goes into this sort of exercise! Well done again team! I've taken the time to categorize the results to make it a bit easier for you. 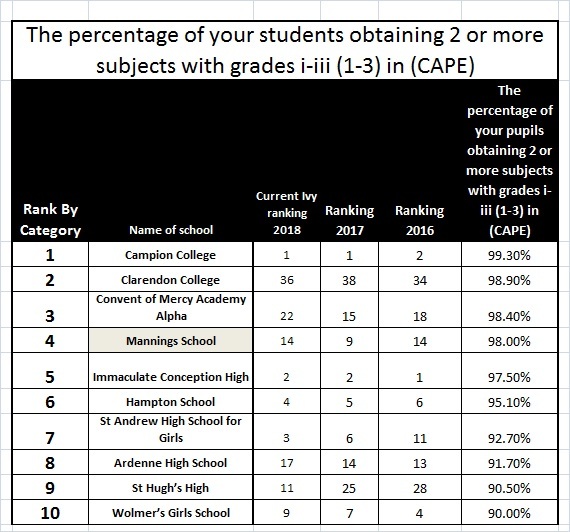 So it's clear, the top school in the island from this report, remains Campion College - two years in a row! Immaculate remains solid at #2. 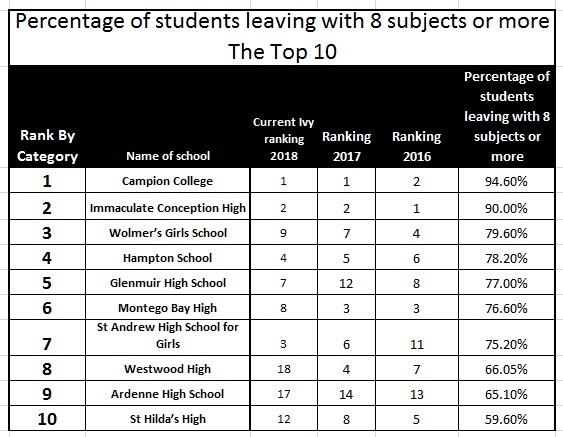 The biggest movers in the island, certainly in the top 10 are Knox College and Mount Alvernia High, gaining eleven and twelve places to be at #5 and #6 respectively - both rural area schools! Who Are The Biggest Movers & Shakers? ... recorded the biggest climb in the island! Both Jamaica College and Calabar comes in for some commendation as well. Both improved by 6 places! Unfortunately, Westwood High (18), Belmont Academy (25) & Gaynstead High (45), lost 14, 12 and 10 places, respectively to be the top 3 losers. Who Held Or Improved Places? The following also are the schools that improved their places this year. 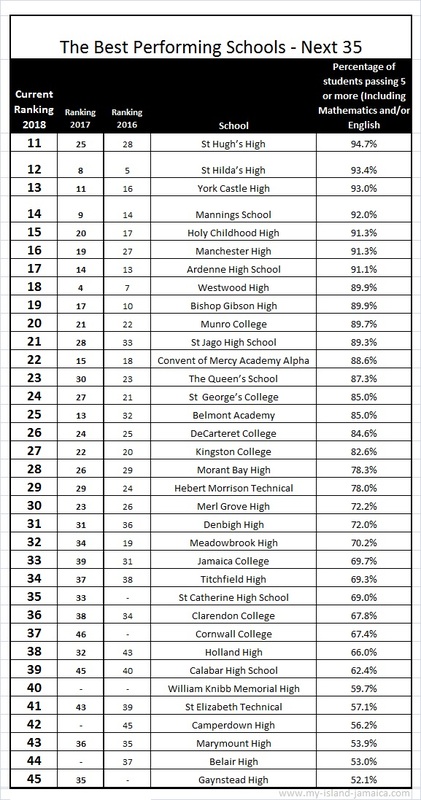 Congrats also to William Knibb Memorial High, Camperdown High & Belair High for making it into the top 45 this time around! English remains a core, and perhaps the most important subject for several reasons. So which schools recorded the highest passes in English? Special commendation to St. Hugh's and Munroe who made it here, although not in the overall Top 10 in the island. And mathematics? 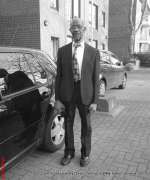 Attaining mastery in Mathematics is considered genius. So who are the best in the island based on passes in Mathematics? 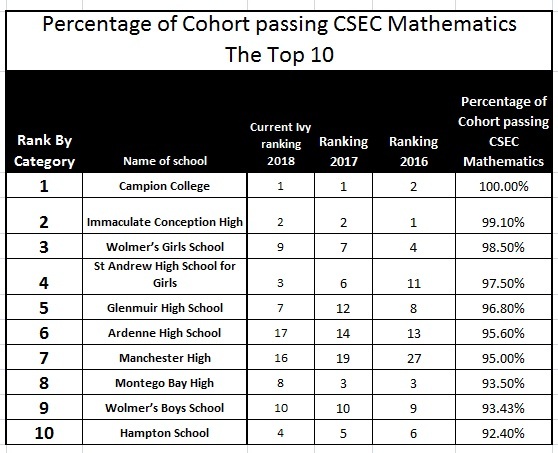 Special congratulations to Manchester High and Ardenne High for their achievement here, although not in the overall Top 10. And who are the institutions that gained the most passes in CAPE exams? And note that only five (5) of them are in the overall Top 10. … all gained Top 10 places in this category! Remember Those Memorable School Years? Remember that teacher you'd never forget? The lunch time huddles? Exam time? The after school activities? We'd love to hear from you! Click Here to share your school memories with us. Overall, good stuff though! Well done to the hard working teachers who engineered much of this, and to who are many times no sufficiently recognized. By the way, do you know someone who might be interested in this ranking report? Or simply forward this page to them via the social media links below. As usual, welcome your comments here. Recommended: If not already none, be sure to subscribe here to be one of the first to get the next rankings when they are released. 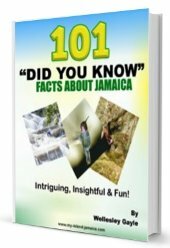 Please note that in their latest publication, the president of Educate Jamaica indicated that this (2018) report, will be their last ranking using the current criteria of 5 or more subjects (Mathematics and/or English). Going forward the ranking criteria will include S.T.E.A.M, Vocational and CAP Programmes. We look forward to that!! They say our school years are the best years, and that's absolutely true! Well, this is your grand opportunity to share those memories. And, after sharing, don't be surprise if you get an old classmate responding/adding to your submission! Not sure what to say, no problem...just 'talk'. Is the picture on your computer? Beautiful! Click the button and find it on your computer. Then select it.